What If They Stop Buying Our Debt? “I have always depended on the kindness of strangers,” said Blanche DuBois, in the final words of the play A Streetcar Named Desire. Well, don’t we all. Many citizens probably still cling to the old saw that public debt doesn’t matter because “we owe it to ourselves.” Wrong. Debt always matters. And as for whom we owe it to, it is a lot of kind (or, at least, not yet unkind) strangers. As recently as 1970, foreign holders of U.S. debt were essentially non-existent. 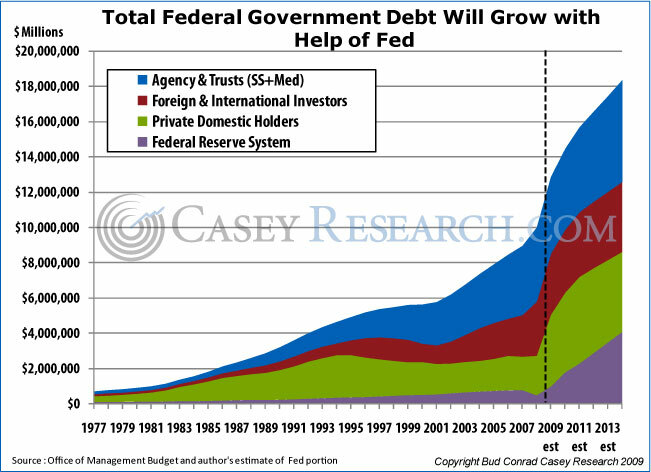 But their slice of our obligation pie has steadily increased, especially over the past two decades, until now foreign governments and international investors hold about 35% of Treasuries, as the following chart reveals. Of about $11 trillion in U.S. debt, foreigners have about $3.8 trillion, with China in the lead at nearly $1 trillion and Japan not far behind at around $750 billion. Most likely, though, this trend has already leveled off. The Chinese, Japanese, Russians, and Indians have openly announced their decision to cut back on further purchases and existing holdings of U.S. government debt. Beyond that, the source of funds previously allocated to their purchases — trade surpluses — has declined sharply with the recession. As a consequence, going forward, foreign buying is more apt to shrink than increase. While foreigners are continuing to show up for the record-sized Treasury auctions, it’s due to the dollar retaining its status (albeit shakily) as the world’s reserve currency. But they have become quite cautious, generally investing towards the front end of the yield curve, which is a vote of no confidence in the buck’s future. 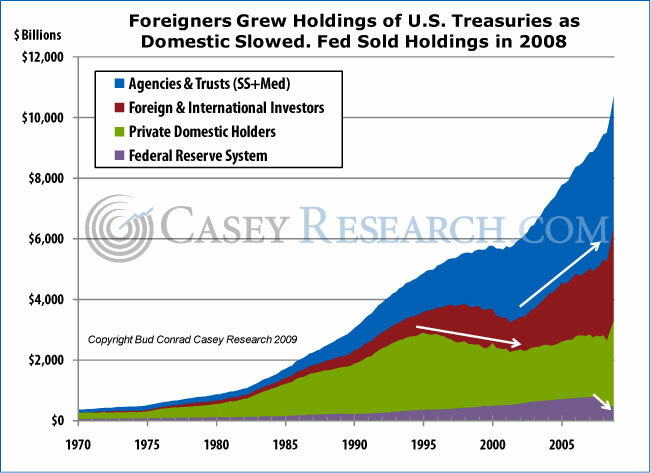 As the chart below illustrates, sales of long-term bonds to foreigners are way down.